The Buffalo Bills new offensive coordinator Brain Daboll spent a good part of his NFL coaching career with the New England Patriots where they had Rob Gronkowski at the tight end position. Gronkowski is one of the most productive tight ends in the history of the game. Now that Daboll is in Buffalo, it is an unknown just how important the tight end position will be in the Bills offense for 2018. Going into training camp, there are currently five tight ends on the Bills roster and as I see it, not one is a dominate NFL player. In 2017, Charles Clay was the leading receiver from the tight end group with 49 receptions for 558 yards and two touchdowns. That was actually his least productive season in the last five. He has averaged just over 50 catches so 2017 was actually a down year for Clay. Clay has adequate tight end size, he is athletic and has good to real good play speed. He is the most complete tight end on the Bills roster and because of that he is asked to do more than the others. Clay is an adequate blocker but not exactly what the Bills would like when he is asked to play in tight to the line. Clay is best utilized when flex out and used as a “move” tight end. At this time I don’t know if the Bills have a top “Y” tight end. The Y lines up in tight and has to be a good blocker. Having a tight end who can be a top blocker can be a big plus to the run game. Right now the best blocker the Bill may have is Khari Lee. Lee doesn’t have the bulk that many blocking tight ends have but he has some explosiveness through his hips and knows how to get and keep good position. Lee has never been known to be a top receiving threat, and for his career he only has one reception. This will be a make or break camp for him. The number two tight end on the Bills roster is third year vet Nick O’Leary. O’Leary runs good routes and has very good hands but he lacks top end speed and is very average as a blocker. Logan Thomas is probably the most athletic tight end on the roster but is still very raw because he was a quarterback in college. Thomas has the natural physical traits that many teams look for at the position but so far in his career he has shown that he can’t block. Unless he can show an improvement in that area he may struggle to make the roster. 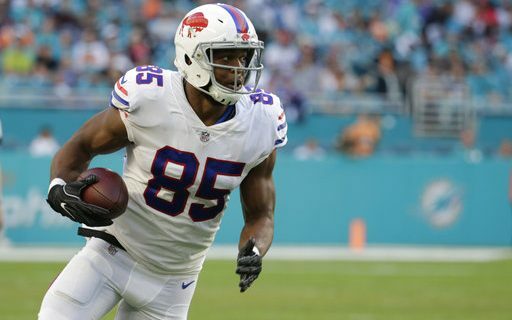 The two other tight ends on the Bills roster are Keith Towbridge in his second year, and Jason Croom, who is a first year player from Tennessee. Towbridge is interesting in that he has ideal size to play the Y effectively but still needs some work on his blocking technique. It will be fun to see how he progresses in camp. Croom is an athletic guy who will compete for a move tight end spot on the roster. Greg has already broken down the Bills receivers, offensive line, defensive line and linebackers.